Below are some recent photos of the past few weeks. The semester is now over, and the students are out doing a month of practical work. I was busy teaching, sometimes 3 or 4 lessons a day during the week. On 12 June, the 3rd year class (those graduating) had their final examinations in the form of a series of oral tests. When I have the opportunity I will write more about that experience. 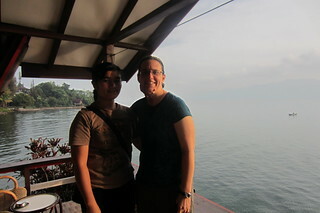 I was able to get some rest and relaxation at a nice place on Lake Toba. Now I’m ready to work again, and will return to the Nommensen University in Siantar. I wish I was able to update more often. Enjoy the photos. Please find more here at my flickr site. 12 June 2012. Posing for a picture. 12 June 2012. Some of the students singing at morning worship on the day of the final exam for the 3rd year class. 12 June 2012. Some of the 3rd year class wait for their turn to face the panel of questions. 20 June 2012. A nice view of Lake Toba from Tuktuk, Samosir. 20 June 2012. 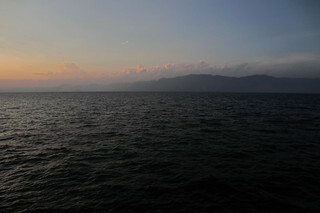 Taking a few days rest on Samosir…from our hotel room.